Vivien’s collection of fine porcelain takes its inspiration from the Irish landscape. 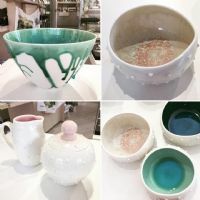 The tactile surfaces and marine palette of glazes reflect the light, colour and texture of the Irish coast, while the pops of colour found throughout her tableware are reminiscent of Irelands’ vibrant flora. Vivien pays homage to classic pottery form and adds her own contemporary twist with distinctive embellishments. The resulting pieces invite touch and interaction.